Fear of falling on ice? Weak ankles? Weak core strength? Uneven leg strength? Trying to improve balance? Discover a simple daily exercise you can do in under two minutes to improve balance and strength and learn how to walk like a penguin on ice to avoid falls this winter. It’s that time of year where risk of falling because of ice from winter weather is a serious concern. 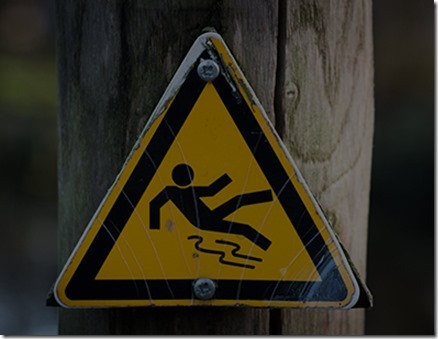 Did you know, however, that there are other risk factors that increase risk of falling? Falling is not just a concern for older adults, but the entire population. Some risk factors that increase risk of falling certainly include slippery surfaces and tripping hazards such as poorly placed rugs and unlit stairs, but your risk of falling can also be increased if you have weak ankles, weak core strength, uneven leg strength and/or poor balance. See the pictures below for two easy ideas to help prevent falling. 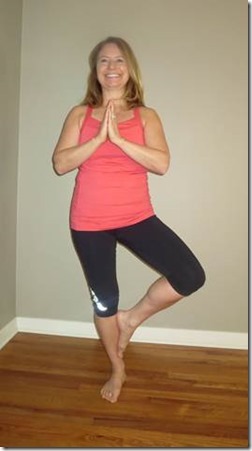 Additional scientific research supports the use of balance exercises commonly used in yoga sequences to improve strength and reaction ability to avoid falls.6, 7 A static exercise that involves a one-legged stand also improves balance.8 Here is a simple exercise you can do daily in under two minutes to decrease your risk of falling while increasing leg and core strength and reaction ability. 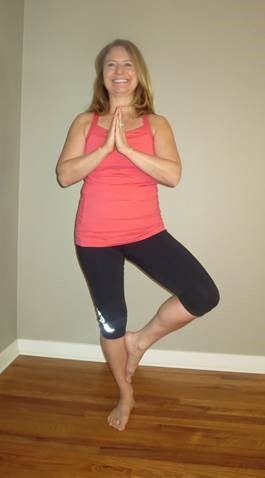 This exercise is known in the yoga world as Tree Pose and in the fitness world it is called The Stork. Read the instructions below the pictures. Use the kickstand version pictured in Option 1. Wearing shoes will provide more stability and support. Standing near a wall or counter will provide additional support. Hold each side for 15-45 seconds. You may need to gradually build up to 45 seconds per side. Progress to Option 2. As your balance improves you can try letting go of the wall. Try taking off your shoes as an option. Do this balance exercise most days. Get in the habit of making it part of your morning routine; use the bathroom, brush your teeth, do balance training. Notice how, with practice, your balance, leg strength, core strength and balance improve. Find a non-moving focal point to fix your gaze on to help with balance. Focus on good posture and body alignment. Drop you tailbone toward your heels to avoid too much arch in your low back. Lengthen your spine through the top of your head. Focus on distributing your body weight evenly over the foot supporting your body weight; not too much weight toward the ball, not too much toward the heel. Don’t get down on yourself if you “fall-out” of the balance pose. This will challenge your reaction ability to catch yourself to help with you fall prevention training. Make good use of your time while waiting in line. Try The Stork using your shopping cart as support. Avoid holding your breath while balancing. 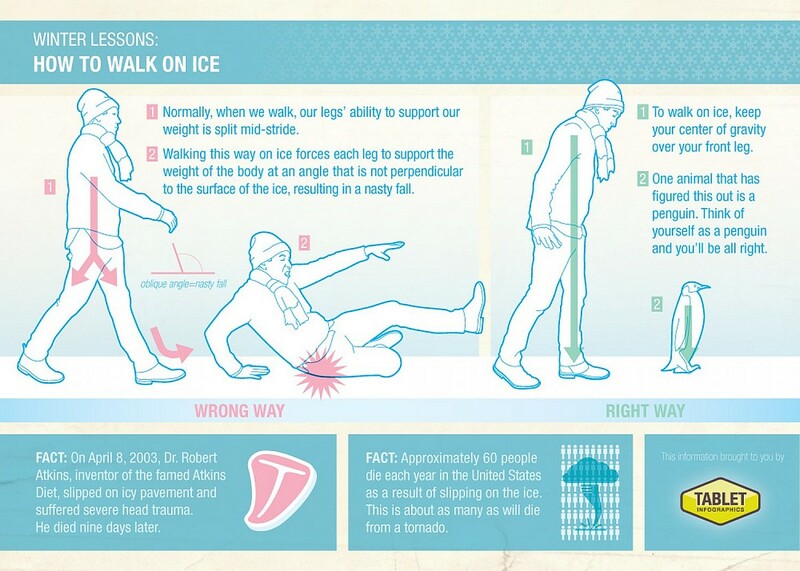 Review how to “Walk like a Penguin,” to avoid falling on ice. Diagram provided with thanks to image designer Curtis Whaley. Used with permission; see his website at Tablet Infographics. Be safe and take care of your health by improving your balance. I would love to hear from you in the comments section below if you think this article is helpful. Suggestions for future blog posts are also very welcome. 1. 10 Leading Causes of Nonfatal Injury, United States, 2014, All Races, Both Sexes, Disposition: All Cases; accessed on 12/20/16 at https://webappa.cdc.gov/cgi-bin/broker.exe. 2. Sherrington, C., Tiedemann, A., Fairhall, N., Close, J. C., & Lord, S. R. (2011). Exercise to prevent falls in older adults: an updated meta-analysis and best practice recommendations. New South Wales Public Health Bulletin, 22(4), 78. doi:10.1071/nb10056. 3. Hirsch, M. A., Toole, T., Maitland, C. G., & Rider, R. A. (2003). The effects of balance training and high-intensity resistance training on persons with idiopathic Parkinson’s disease. Archives of Physical Medicine and Rehabilitation, 84(8), 1109-1117. doi:10.1016/s0003-9993(03)00046-7. 4. Rozzi, S. L., Lephart, S. M., Sterner, R., & Kuligowski, L. (1999). Balance Training for Persons With Functionally Unstable Ankles. Journal of Orthopaedic & Sports Physical Therapy, 29(8), 478-486. doi:10.2519/jospt.1999.29.8.478. 5. Richardson, C. A., Snijders, C. J., Hides, J. A., Damen, L., Pas, M. S., & Storm, J. (2002). The Relation Between the Transversus Abdominis Muscles, Sacroiliac Joint Mechanics, and Low Back Pain. Spine, 27(4), 399-405. doi:10.1097/00007632-200202150-00015. 6. Schmid, A. A., Puymbroeck, M. V., & Koceja, D. M. (2010). Effect of a 12-Week Yoga Intervention on Fear of Falling and Balance in Older Adults: A Pilot Study. Archives of Physical Medicine and Rehabilitation, 91(4), 576-583. doi:10.1016/j.apmr.2009.12.018. 7. Cowen, V. S., & Adams, T. B. (2005). Physical and perceptual benefits of yoga asana practice: results of a pilot study. Journal of Bodywork and Movement Therapies, 9(3), 211-219. doi:10.1016/j.jbmt.2004.08.001.